The lab activity described here was developed by Erin Bardar, Candace Dunlap, and Sarah Hill of TERC for the EarthLabs project. In this lab, students will explore evidence of recent change in the cryosphere. In Part A, they will use an online interactive to visually explore how six Alaskan glaciers have changed over the last hundred years. They will also use image processing software to measure how much area a glacier in the Himalayas has lost over time due to rising temperatures. 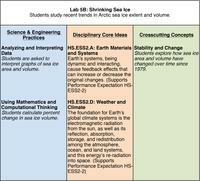 In Part B, students will study recent trends in Arctic sea ice extent. In Part C, they will explore the ice-albedo feedback effect and think about causal connections between climate and the cryosphere. 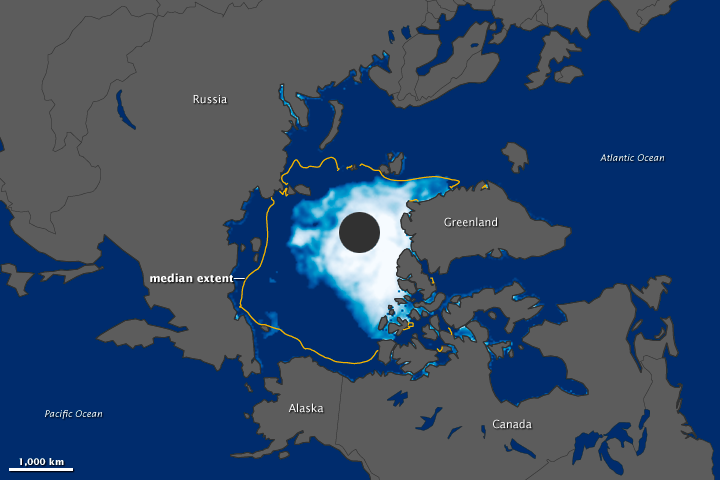 On August 26, 2012, the extent of Arctic water covered by sea ice fell below 4.17 million square km (1.61 million square miles), the record minimum set in 2007. In Part A: Students first visually examine photograph pairs to see how glaciers and the surrounding landscape change over time. They then use ImageJ to measure the area lost by the Gangotri Glacier in India since 1780. NOTE: All student computers will need to have ImageJ installed before beginning Part A of this lab. 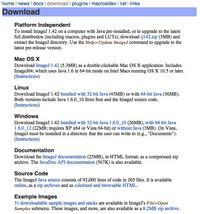 ImageJ is free public domain image processing software developed at the National Institutes of Health. Its power and flexibility allow it to be used as a research tool by scientists in many disciplines, from medicine to astronomy. Installers are available for Windows, MacOS and OSX, and Linux. You can use ImageJ to display, annotate, edit, calibrate, measure, analyze, process, print, and save raster (row and column) image data. It reads most common raster image formats as well as raw data files in text format, such as from spreadsheets. ImageJ also supports stacks - multiple images in a single window - for animation and analysis. 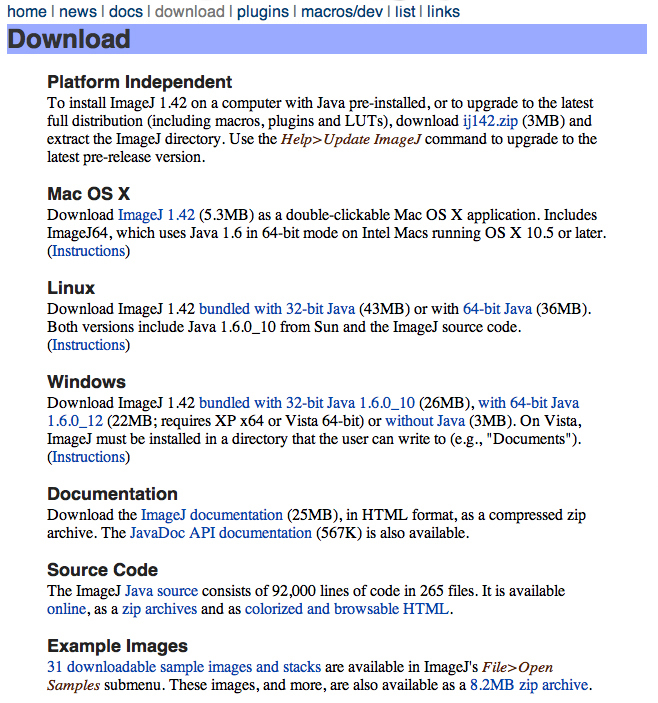 Go to the ImageJ Download page, and download and install the application for your operating system. Click the ImageJ Download page and it will open in a new window. Click the link that appears directly below the name of your computer's operating system (e.g. Mac, Linux, Windows). This action will transfer a compressed file of the software to your computer. Your browser should automatically expand the file, creating an ImageJ folder on your computer's hard drive. For more details, or if you have problems running the application, access ImageJ's Installation Instructions then select your operating system. Double-click the ImageJ icon to launch the application and choose Help > Update ImageJ.... A window will appear, telling you the version you are currently running and a list of upgrade versions. 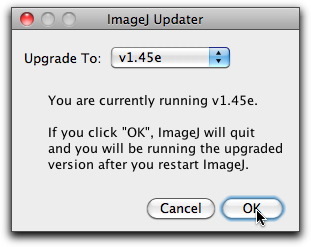 Choose the version you want to upgrade to (usually the most recent, or default version) and click OK. After the update downloads, re-launch ImageJ to run the new version. NOTE: Some users have reported problems updating ImageJ in certain versions of Windows. To fix this problem, you will need to manually update ImageJ. When prompted where to save the file, navigate to the ImageJ folder and save the file there. Replace the existing ij.jar file. For most installations, the ImageJ folder will be in the Program Files directory on your hard drive. The path to the ImageJ folder is c:\Program Files\ImageJ. The ImageJ toolbar contains both built-in and customized tools for manipulating images. Most of the tools are similar to those used in other graphics programs. In Part B: Students study recent trends in Arctic sea ice extent and revisit the topic of albedo. In Part C: Students Students learn about the concept of albedo and the ice-albedo feedback effect using the online interactive Earth's Albedo and Global Warming. They will also do a "Connection Circles" activity to explore the concept of feedback loops. This lab contains Flash-based interactives. Visit our Flash Information Page for directions and to test that your computer is set up for Flash. General recommendations for classroom implementation as well as guidelines and facilitation tips for leading class discussions. Read through the lab and teacher resources BEFORE implementing with your students. In Part A: Make sure ImageJ is installed on all student computers before beginning the lab. Practice the exercise yourself before teaching so that you are prepared to answer student questions during the lab. In Part C: Practice the Connection Circle before doing the activity with students. Purpose of the discussion: This discussion will help students better understand reinforcing (positive) and balancing (negative) feedback loops. Facilitation Tips: Hang each group's Connection Circle in the classroom and do a "gallery walk" before beginning the discussion, so that students can see what others have come up with for their Connection Circles. Are the Connection Circles in the classroom all the same? Identify some similarities and some differences. 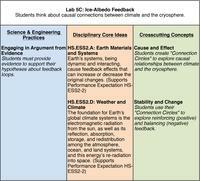 Compare the feedback loops you found in the Ice-Albedo Feedback Connection Circle. Does the feedback loop reinforce/amplify the initial change or balance/dampen it? What makes you think so? Wrap Up: Although their will likely be similarities among all the groups' Connection Circles, there are also likely to be differences depending on students' understanding/interpretation of the "story elements" and the depth to which they thought about connections. Encourage students to talk about these differences and to think about additional connections they may not have made during the original activity. Before moving on, be sure that your students have a good understanding of the difference between reinforcing and balancing feedback loops. Also, make sure students think about the balances between reinforcing and balancing feedbacks and how equilibrium is typically maintained, with significant changes to climate occurring only when the normal balance is tipped in one direction or another. Suggestions for how to use Student Notebooks for Lab 5. Have students write down the learning objectives for Lab 5. Have students record answers to all Stop and Think questions. Have students record answers to all Discussion questions. Have students write down any questions they still have about the content covered in this lab. Assess student understanding of topics addressed in this investigation by grading their written responses to the Stop and Think questions or by using Stop and Think questions as part of whole-class or small group discussions. Explore background information and content extensions related to Lab 5. Visit the NOAA's Earth System Research Lab website for background reading about Understanding Feedback Loops in the cryosphere. For additional background information about the ice-albedo feedback loop, read the Windows to the Universe article Ice-Albedo Feedback: How Melting Ice Causes More Ice to Melt. Watch this NASA animation of Yearly Arctic Sea Ice to see the movement of yearly Arctic ice minimums with shading to show the age of remaining ice, demonstrating how not only ice is melting but that there is less older ice as well. This video from NASA Goddard briefly explains how satellites measure sea ice in the Arctic and differences in types of Arctic ice. For additional information and beautiful and powerful imagery of how climate change is affecting Greenland, consider showing all or parts of the 2013 NOVA video Extreme Ice, which is no longer available to watch at PBS online but may be found at your local or school library. Approximate running time: 53 minutes. EET Chapter: Using NASA NEO and ImageJ to Explore the Role of Snow Cover in Shaping Climate: "In this chapter, you will investigate satellite images displaying land surface temperature, snow cover, and reflected shortwave radiation data from the NASA Earth Observation (NEO) website. Download, explore, and animate these images using ImageJ, a public domain image analysis program from the National Institutes of Health (NIH). Then use the web-based analysis tools built into NEO to observe, graph, and analyze the relationship between the three variables."